One of my favorite people in the world to talk to is my pastor. Our conversations are wide-ranging: we might talk about Dietrich Bonhoeffer‘s writings one day and the ins and outs of starting a charity the next. Indirectly, she’s provided fodder for several posts here at The Simple Dollar. A few days ago, we were talking about some of the history of the church when she used the offhand phrase “honest to a fault” in reference to a person that we both knew. My impression of this person was similar – he’s just one of those people that comes at everything with 100% honesty, unafraid to admit his own faults but also unafraid to say exactly what he thinks. I’d go so far to argue that dishonesty is at the root of almost every significant personal finance problem people have. Let’s walk through some of them. Not planning ahead for the future If you tell yourself that you’ll always be young, your health will always hold out, and things will take care of themselves, you’re lying to yourself. Everyone ages. Everyone has misfortunes in life. Choosing not to plan for them to at least a degree is lying to yourself, nothing more, nothing less. Arguing with your spouse about money Almost every spousal disagreement about money results from some level of dishonesty from one person or another. Either one partner is directly lying by hiding information or mis-stating facts or is indirectly lying by hiding expectations and hopes from their partner. Spending money to feel better about yourself If you spend money on a regular basis in an attempt to make yourself feel happy – or even merely feel adequate – you’re lying to yourself by telling yourself that these material purchases will make you feel better. True happiness comes from within – external signals merely confuse you and mislead you. Making poor investment choices Even poor investment decisions are a form of dishonesty. If you don’t adequately research your investment choices and invest the time to come up with a plan, you’re investing blindly and convincing yourself that blind investing decisions are good ones. The only way to invest honestly is to do the footwork – know what you’re buying and why, not just following everyone else. When you fall into each of these traps – and many others – you’re falling into the trap of dishonesty. You’re convincing yourself – or attempting to convince others – of something that’s untrue (or, at the least, unfounded). Every time you fall into that trap, you end up hurting your own financial future. 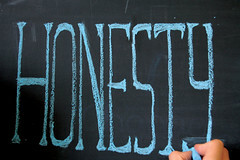 Here are some tactics to add honesty to your life and decision-making processes. Strive to always tell the truth about money, especially to your partner. Tell your partner the truth at all times. If you make a spending mistake and charge up a bill, tell your partner. If you’re unsure about your financial state, talk it over. Don’t hide things – be open with the information and with your feelings about it. Face the real numbers at all times. When you get a credit card statement, don’t avoid looking at it. Look at the real numbers and face it. Keep track of your net worth and update it every month so you can see your real progress – and aren’t just relying on telling yourself everything is okay. Don’t buy without a concrete reason. Work hard to separate emotional and tangential reasons from your buying. Every time you go to make a purchase, think about it carefully. Ask yourself why you’re making that purchase, and don’t make it unless you have a real reason for doing so. Don’t make a financial move unless you know exactly what you’re doing and why. If you’re investing in something and you don’t know why, find out why. Research your investments, know your reasons for having them (both in terms of what’s good about the investment and what your goals are and how this investment will help you reach it), and if it doesn’t feel right, don’t do it.